The “Creatures of the Night” run has officially concluded, with yet another amazing time with some awesome participants. As many of you saw early on, the plans for this run changed not too long before the run was scheduled to begin, due to some of the recent storms and damage the southwest deserts have experienced. We planned a route that we knew was a mixture of mostly high speed trails, with the occasional slow technical section to mix things up. 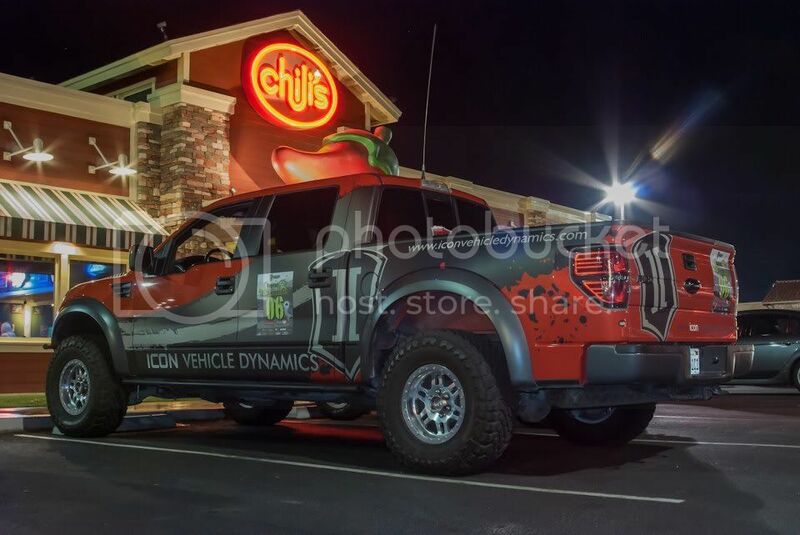 The group met in Victorville at 9PM for a bite to eat, followed by time for each owner to do any last minute prep work and modifications if needed. Most participants took advantage of the time and filled their stomachs and gas tanks before getting together for a quick driver’s meeting before we began the run that evening. Monster Energy provided the group with the needed energy for a long night ahead, as the cans were quickly snatched up by all participants before heading off. With a mixture of new faces, and VERY familiar ones (RICK!) 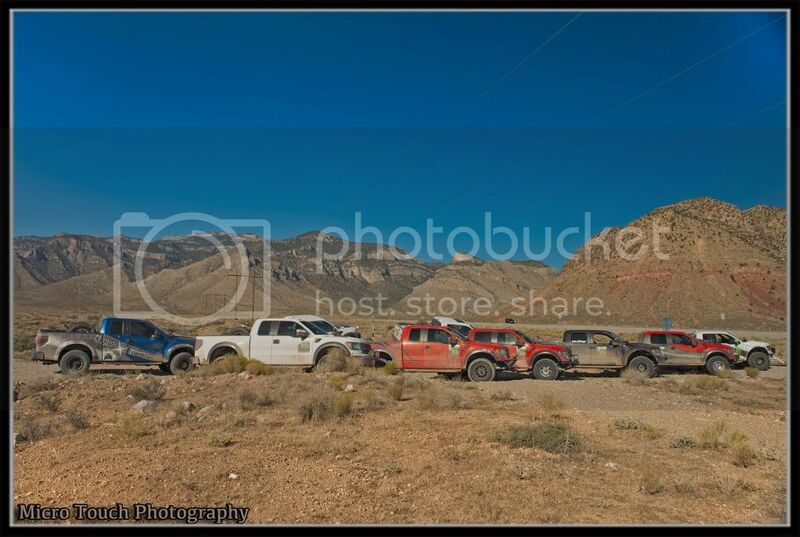 the group of almost a dozen Ford Raptors set off to complete our designed route from Victorville to Las Vegas, Off Road. The trail begins with what you could consider a short “warm up” to get everybody settled in and comfortable… what was next was surely to be considered a nail-biter! During our driver’s meeting we discussed this section, ensuring everybody knew this was NOT a section to be taken lightly! Windy tight trails, up and over the ridgelines heading out of Victorville, giving the run’s participants an enjoyable yet very technical and challenging section of trail. 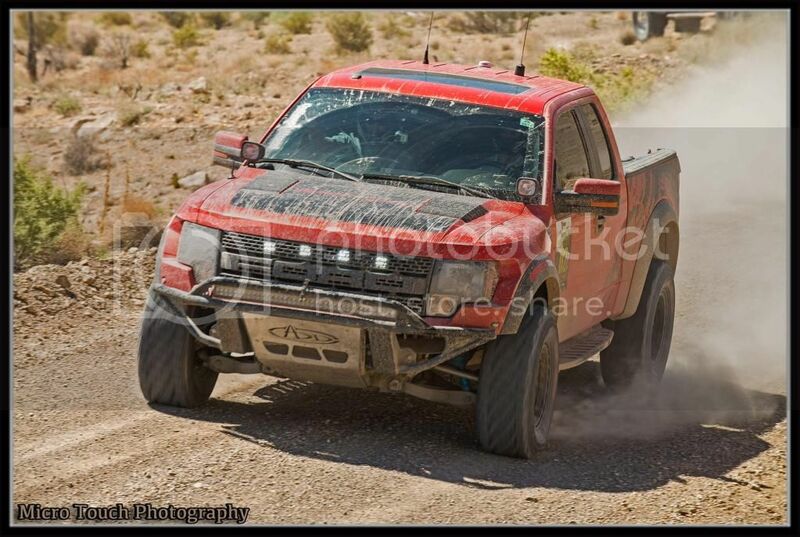 The roar of the Raptor’s 6.2L engine could be heard echoing through the narrow passages our group was now navigating. Our General Tires kept the support team and various participants on course, leading the group along this treacherous, yet enjoyable stretch of trail. The trucks re-grouped at the crossing of the I-40 interstate, where a short break before heading up to our next section of trail. Our original route had the group travelling down the wash sections for about 5 miles… but due to the floods the days before, Connor made the call to bypass this section, due to safety concerns of possible un-marked cautions, and very unstable soft terrain. So, after a short 2 mile drive on the I-15 interstate we bypassed the section in question, and were on our way to our next off road section. The wind picked up a small amount on the next small stretch, traversing some gas line roads, which parallel the I-15 corridor. An extremely fun, windy yet non-technical stretch of trail brought us to our turn onto a large dry-lake bed… which thankfully was still dry! 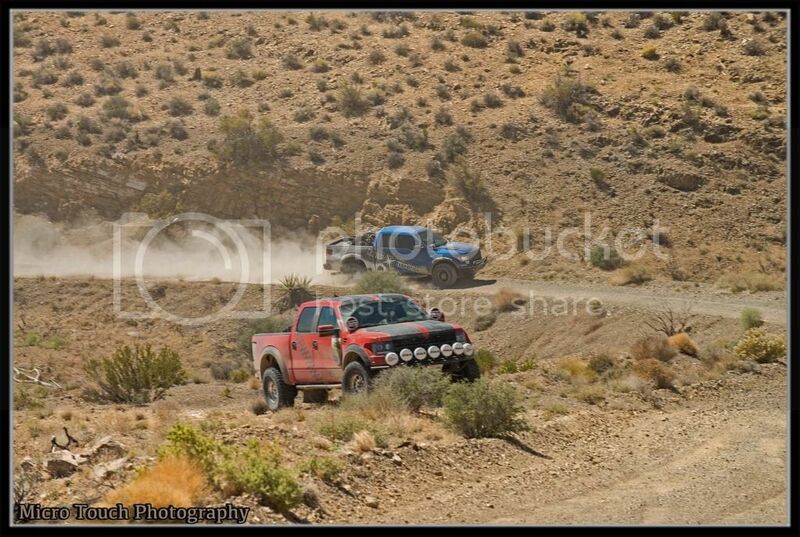 From there, the group forged on towards a long, very high-speed section of dirt roads carving our way through Fort Irwin. Some of the participants spent time exploring the mock towns used for soldier training, while we re-grouped once again before heading southeast towards Baker. The next sections seemed to fly by, as we make GREAT time into Baker, allowing the group to fuel up the trucks and their bellies if needed. By now, most participants were starting to push themselves into second gear, as fatigue mixed with adrenaline started setting in. As we hit the trails once again for the next stretch, the group experienced just how these storms can affect the landscape and what once were groomed trails… wash-outs, debris, and sudden drops were all cautions that although marked, were still a surprise to most drivers! 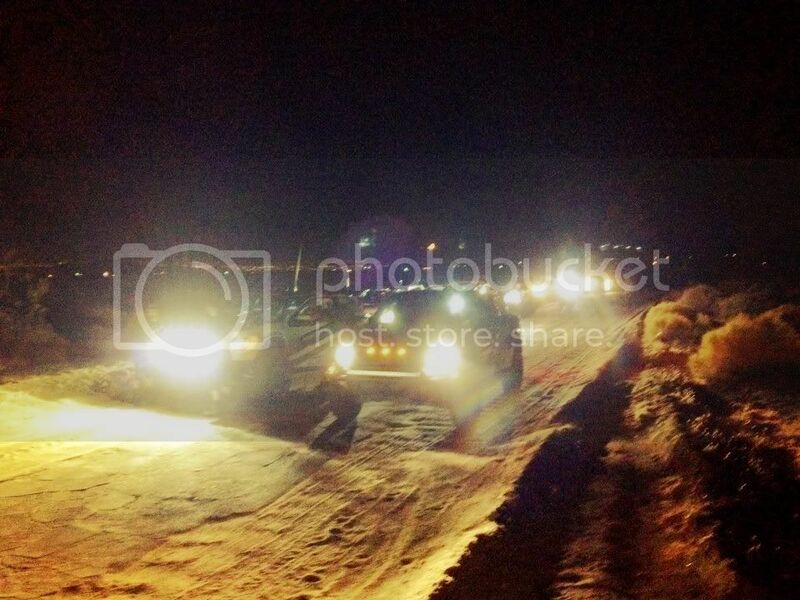 The driver’s concentration is truly in full effect, as they attempt to analyze the terrain with nothing but headlights, bolt-on spotlights, and LED light bars to show the way. 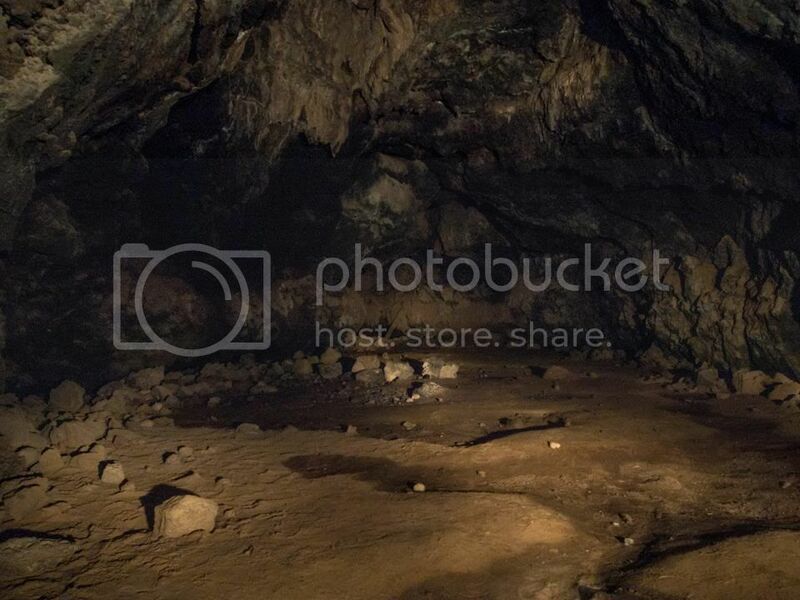 As the sun slowly began to rise, the group made a scenic stop at the Cima Lava Tubes. Natural underground caves, formed from centuries-old lava flows in the area… With the large volcanoes in the background, the group had a short hike up to the caves. What makes big tough men act like scared little girls? Well, apparently “Bats” do! Haha! The cave’s natural inhabitants were not phased by the tourists, although our group definitely got a kick out of seeing some natural phenomenon mixed in with the off road driving. By the time we left the lava tubes, the sunrise was in full effect, making for an absolutely BEAUTIFUL drive towards Cima Rd. As we flipped our Oakley shades on to help shield the rising sun. The joshua trees lined both sides of the trail, which was compromised of white, brown, red, and black dirt… a truly stunning section of trail, which also happens to be some of the groups favorite sections! High speeds, with sudden drops, which can be taken at high speed, keep drivers and passengers on their toes. Soon after, the group made a quick stop at the Shell station to re-group before heading north. The group crossed over the hills and into the valley, passing the Sky Ranch Estates. Connor offered a tour of the estates to the drivers who haven’t experienced the odd community… where their hangar is literally in their driveway! RSV1 experienced a minor electrical issue, which gave the group an opportunity to help the RE team for a change! 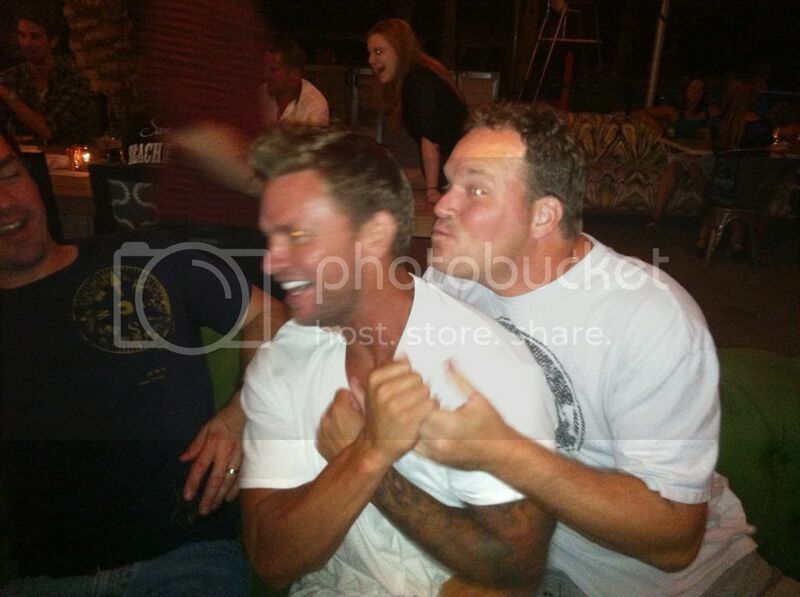 Gary with the fuses, and Gordon with the muscles! We then headed east, over the mountain pass leaving Sky Ranch Estates, towards Goodsprings. This windy stretch of trail snakes through some incredible canyon views, as the wide sweeping trails allow for some high speed drifting in a truly scenic location. The smooth graded trails were enjoyed by all, as we headed into what is arguable the roughest section of trail our groups usually experience. All drivers did a GREAT job of navigating the rough rocky sections of trail, avoiding sharp boulders and some very deep washouts! The Method Wheels (wheel choice of most the participants on the run) held up perfect under the rock-crushing punishment we were putting these trucks through. Remarkably, the group made it through the rough section without a single incident… keep in mind this was around 8AM, when our minds and body’s were about ready to get some rest! A quick photo op at the end of the trail on Day 1! Soon we were headed to the Hard Rock Hotel… where Connor had arranged early check-in for the group! Most of us had a quick bite to eat for breakfast before heading up to our rooms. 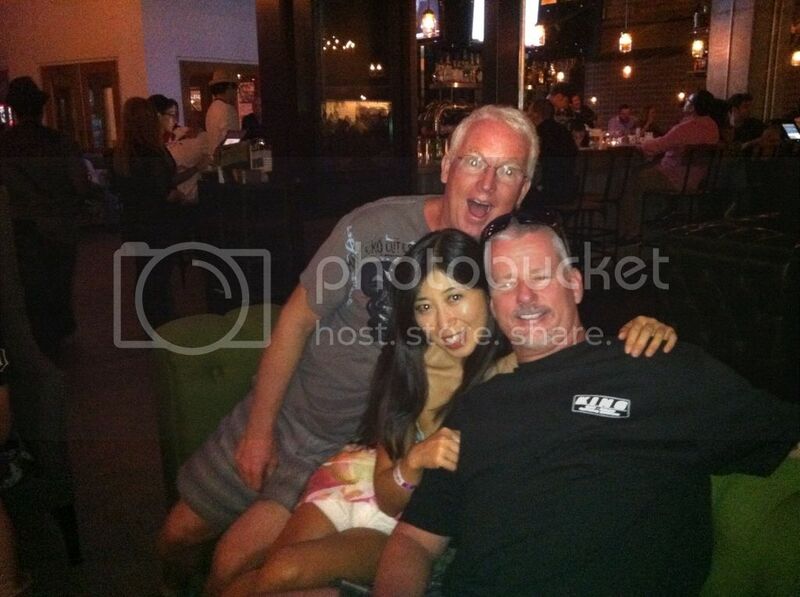 From there, some relaxed… some slept… some hit the pool… and others hit the bar! Saturday was a blast, and all participants took advantage of the extra time in Vegas to enjoy themselves… whether at the pool, Freemont Street, or the casinos, it was a great day. We all met up at 8:30PM at P.F. Chang’s Chinese restaurant for a group dinner, where we shared stories from our run… and our Saturday activities! The group presented Connor with an “Emergency Kit” for use next time he finds himself in a bind… after dinner, the group was free to go their separate ways, although there was a small gathering poolside at the Hard Rock, where we shared some after dinner mixed drinks, Azunia Tequilla shots, and camaraderie among participants before heading to bed to rest for day 2’s ride home! Rise and shine. 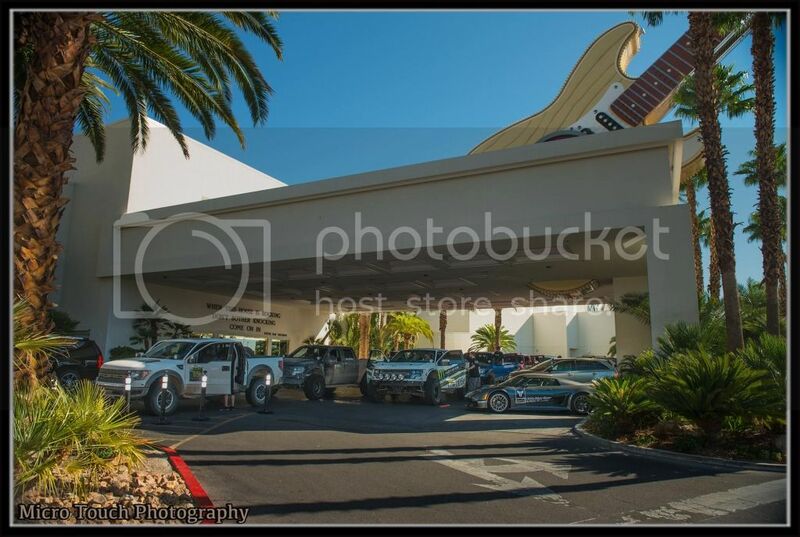 8:30AM at the valet, where the Hard Rock Hotel was gracious enough to allow us to use their valet staging area to prep our trucks for day 2! Day 2’s route was to be the same return route as our night run, allowing for a change of scenery in the daylight, as well as a chance to run some of the trails that would now be familiar to most drivers. This was very evident, as the group made progress at a BLISTERING pace not typically experienced with our group runs. In just 2 short hours, we were already at the Cima lava fields, and heading towards baker. 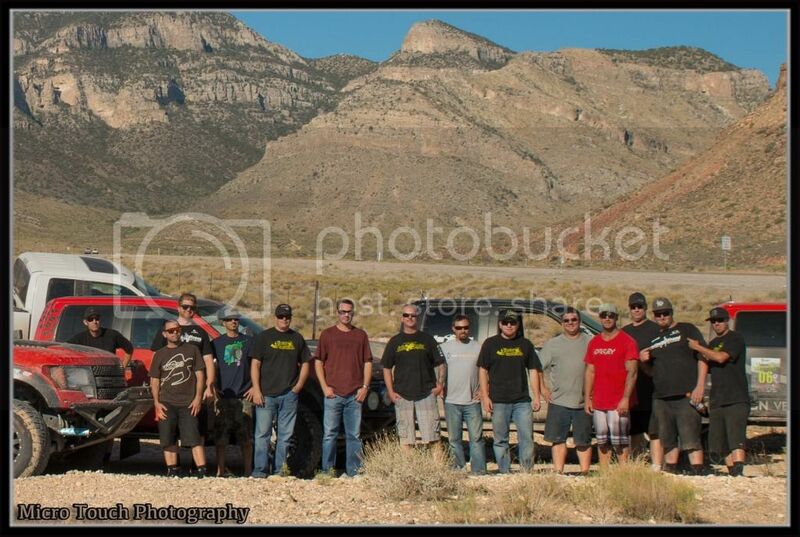 Day 2 was also used for some great photo ops. Here are some of the photo’s taken by Gary Fries, beautiful as always! As RSV4 stopped to lend a hand with a tire change-out, we heard a call come over the radio that something had happened to Truck #1, with driver Rick Ryckman. Rick and Scott (Rick’s Co-Driver) were on the last stretch of trail heading into Baker, when we heard them call for help over the radio. 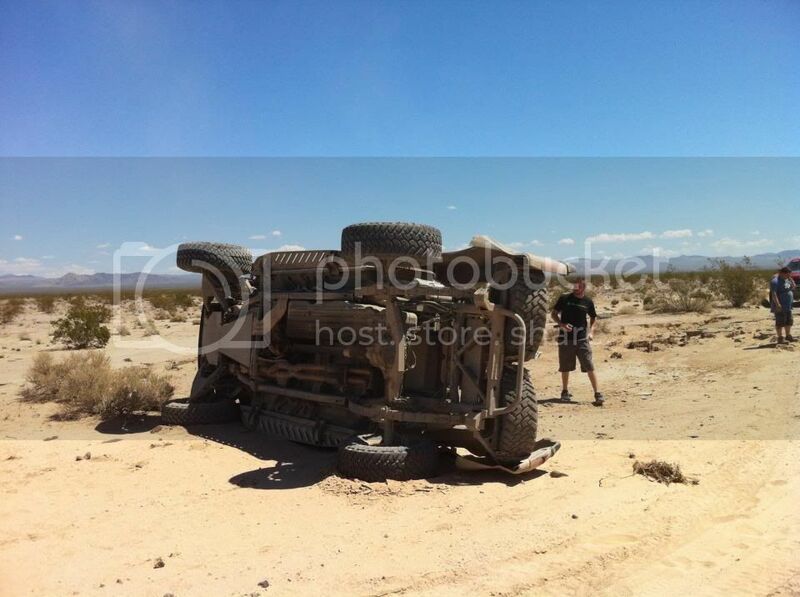 Originally, we only knew a few things… one, that they had an emergency… and two, that the truck was on it’s side! 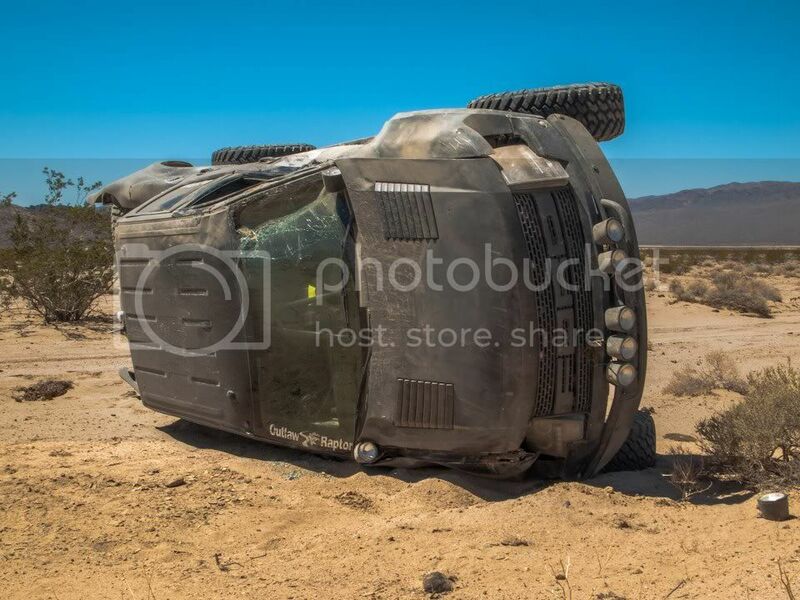 Unfortunately, during the rollover, the radio for Rick’s truck had somehow been keyed and was stuck broadcasting, making communication for everybody else very difficult. 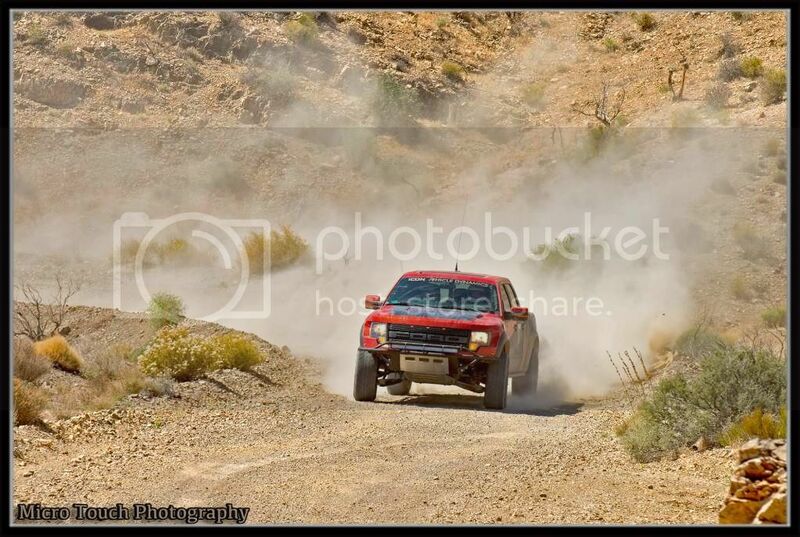 Gordon Brown and his Co-Driver Jeff were first on the scene, as they were behind Rick. To the relief of Gordon and Jeff, they found Rick and Scott both on their feet, outside the truck walking around. Shortly after, Gordon made a broadcast to all parties that everybody was “OK” and there was no injury or emergency. 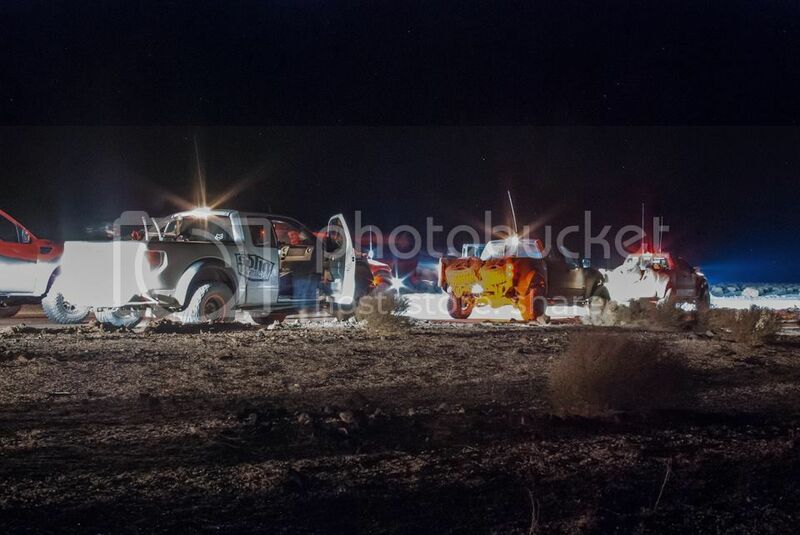 Not long after the rollover, the truck was pulled back onto it’s wheels and the damaged body work was stripped, leaving a bare front end! 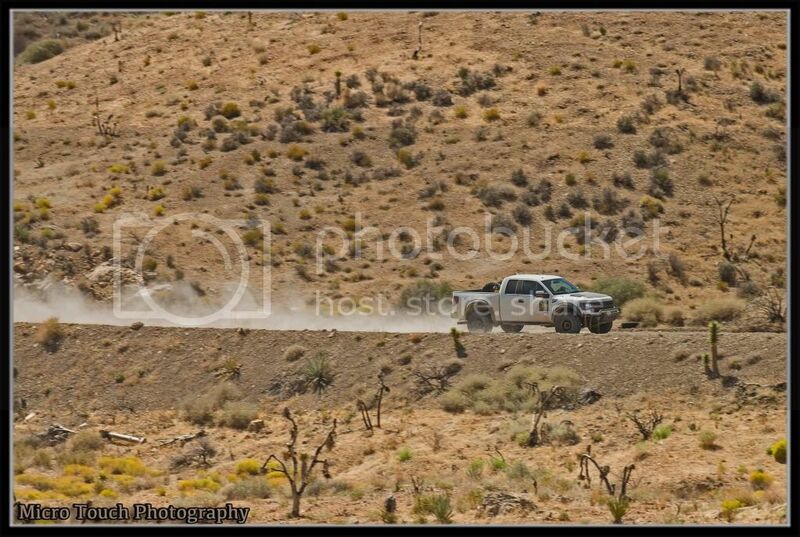 A few engine cranks later, and the truck started right up to the surprise of everybody watching. A quick analysis by the R.E. 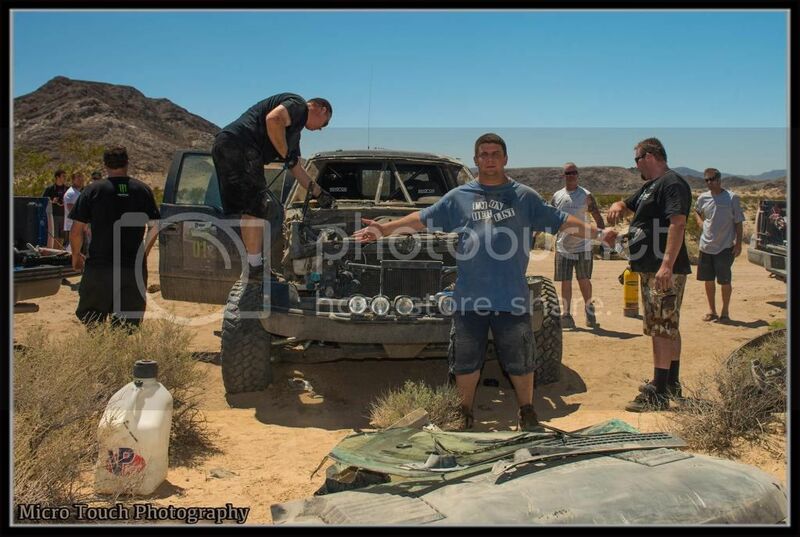 crew, and it seemed the truck was 100% fine, mechanically! The decision was made by Connor to drive the truck back to the Outlaw shop, avoiding a tow and allowing the crew to show how tough these trucks really are! 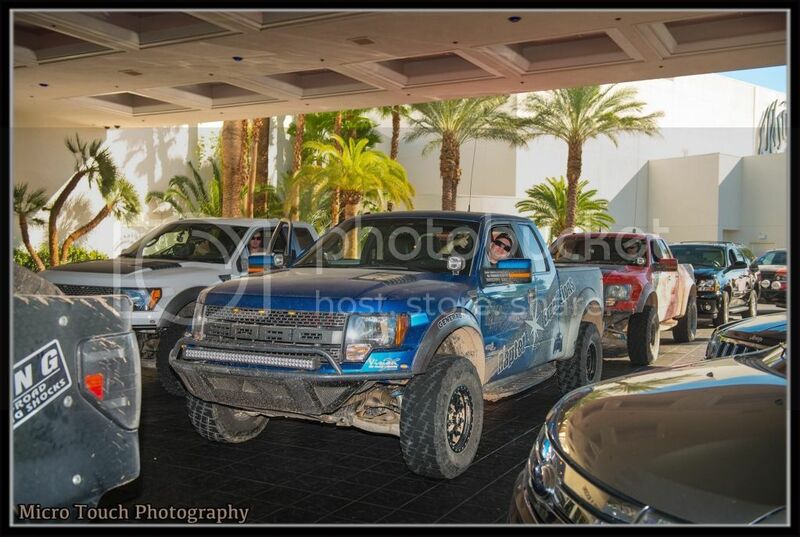 Some pictures of Rick’s truck, and Rick posing for the camera! For those of you that know Rick, there are a few things that everybody undoubtedly agrees on. 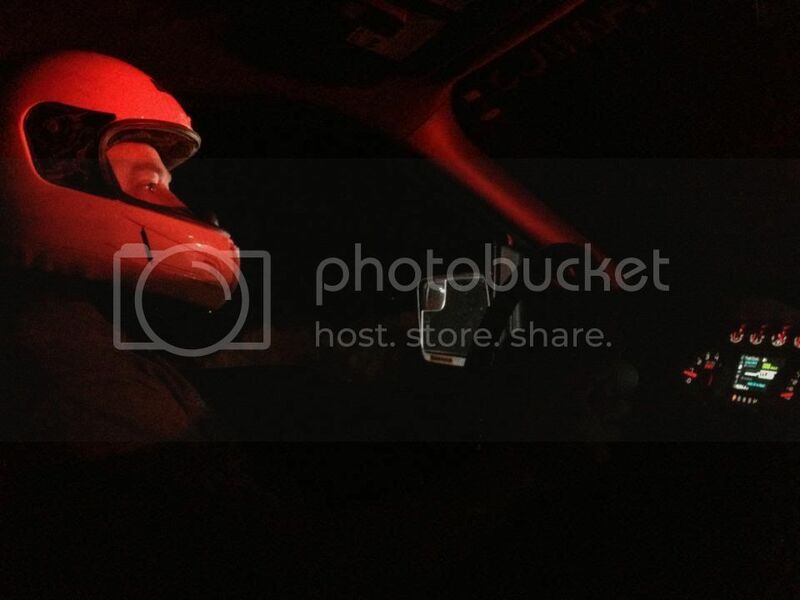 Rick drives fast, gets right to business, and is fearless behind the wheel! 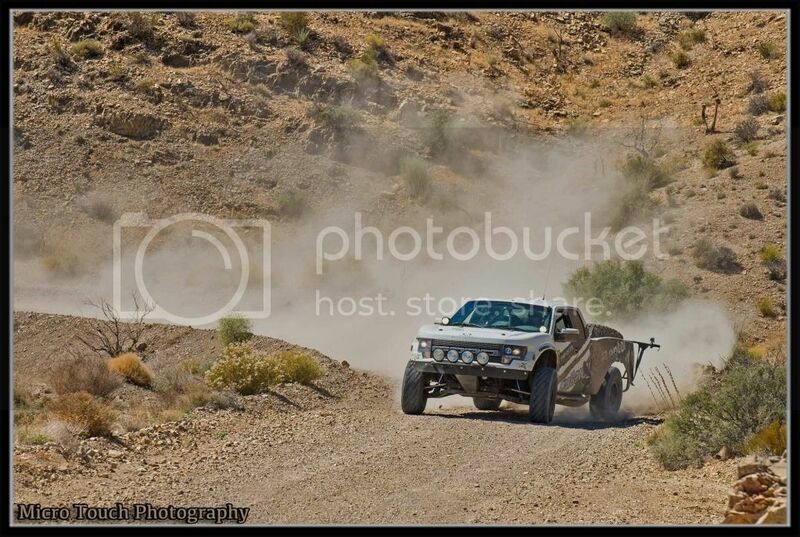 Rick constantly pushes his truck to the limit of what is feasible in a factory pre-runner like the Raptor. 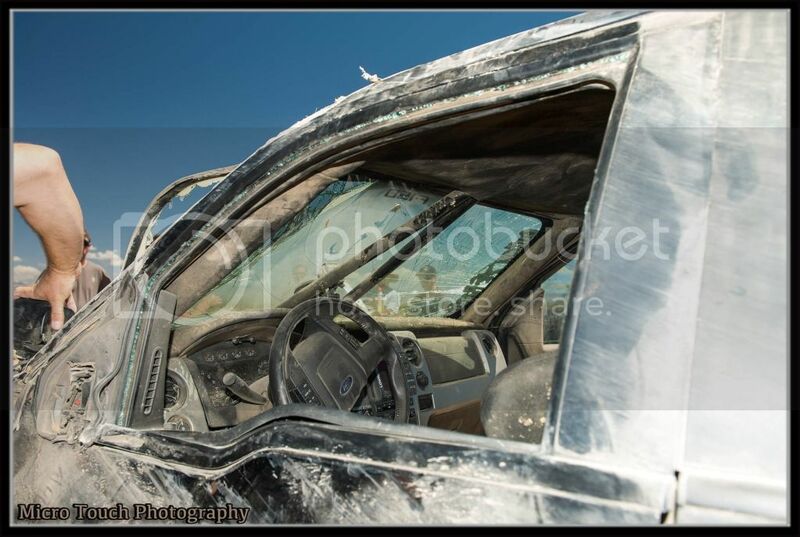 With that in mind, Rick took the proper steps and had his truck built to withstand the type of abuse he puts it through, in addition to making it safe in the process. He is a long-time veteran of the Raptor Expedition runs, and has almost 10 runs under his belt. Any time you’re pushing yourself to the next level, which Rick typically CANNOT resist, you walk a delicate line. If given the choice of driving “fast” or “faster”, Rick will always push himself to be “faster” and in that respect has definitely improved his skill and speed over the past year or so we have shared on these runs. Above all, the team at Raptor Expeditions is relieved that Rick has chosen to spend the money to be responsible in his pursuit of speed. Rick, you’re a joy to have on the runs, and we’re all very thankful that you and Scott escaped without injury. Props for being calm and cool, and we CAN’T WAIT to see what’s in store for you and your truck after the rebuild. After Rick’s stunt show, the group decided it was a good time to wrap up for the day, as everybody’s adrenaline was starting to subside. 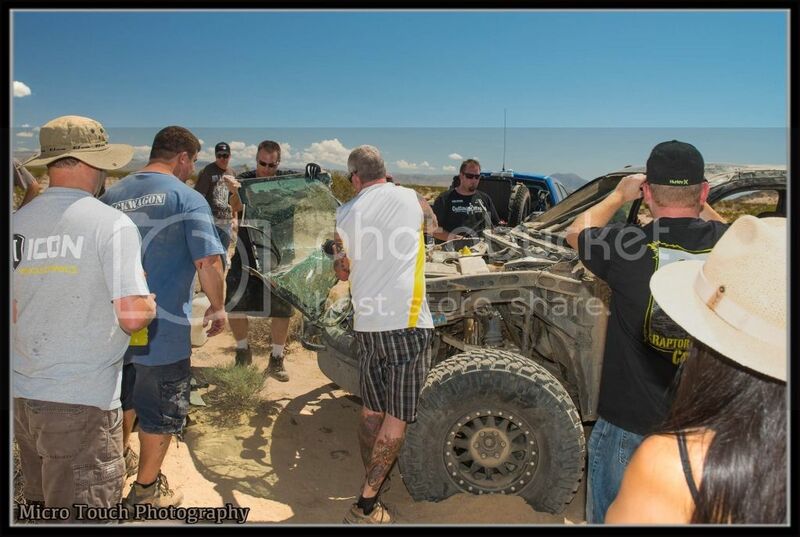 We fueled the trucks in Baker, grabbed a quick bite to eat, and then all participants headed their separate ways. All in all, it was a GREAT run, and all participants truly shared what we at R.E. consider one of our favorite runs to date. 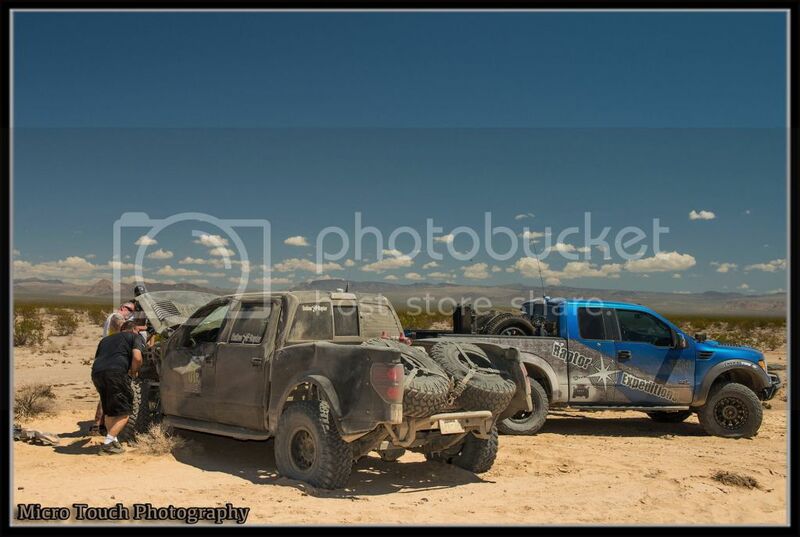 The run’s participants also had the first hand opportunity to see how tough these Raptors really are, even after a seemingly devastating roll-over, the truck was driven 200 miles back to Los Angeles! 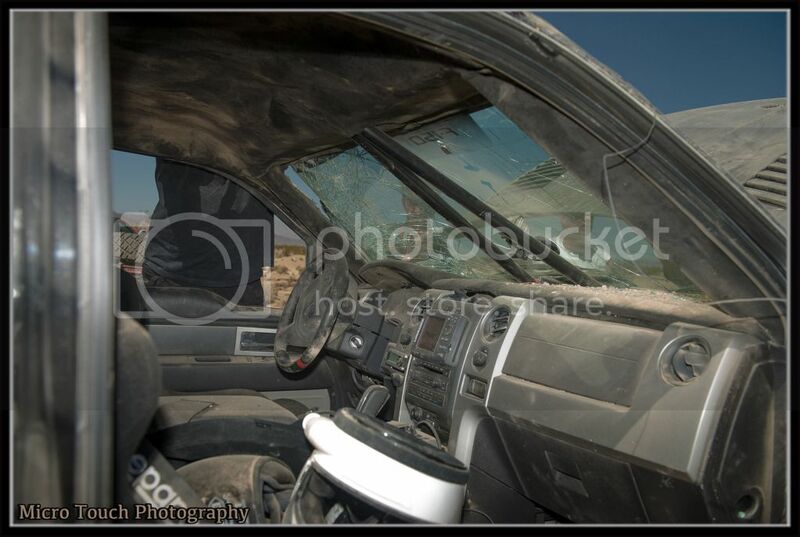 Talk about “Ford Tough”! We’d like to thank everybody that joined us on the run, and for helping out when needed! 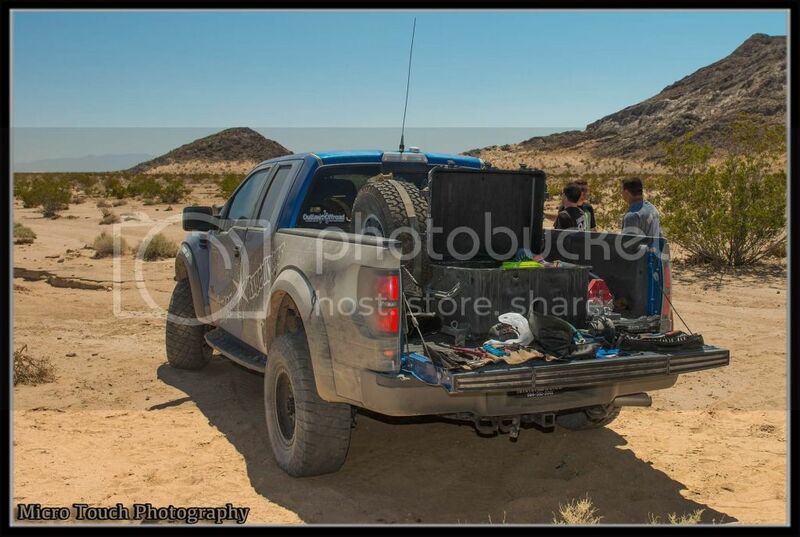 We were more than happy to have the Icon crew join us for a run, and while we showed them what our expeditions group does, they got a chance to demonstrate some of their skills behind the wheel of their Icon-prepped Raptor. We’re looking forward to seeing more vendors on these runs in the future, and hoping to see the Icon boys on more runs in the future! As always, a special thanks to Gary Fries for taking incredible photos.